Techcruch carried an interesting note on how you can create a book by importing wikipedia pages. What is great is that you can create a book on any topic, sort information by chapters and PediaPress takes care of typesetting, printing and shipping. PediaPress allows you to download the PDF or OpenDocument format free of charge. This harps back a conversation on Jon’s Appfrica blog about how we must think beyond just the net to truly democratize information. We have to think of new ways to get it into the hands of people who need it most. Perhaps PediaPress is an step in this direction. Did you know that you can assemble your own wiki pages from Wikipedia and print them out in book form? 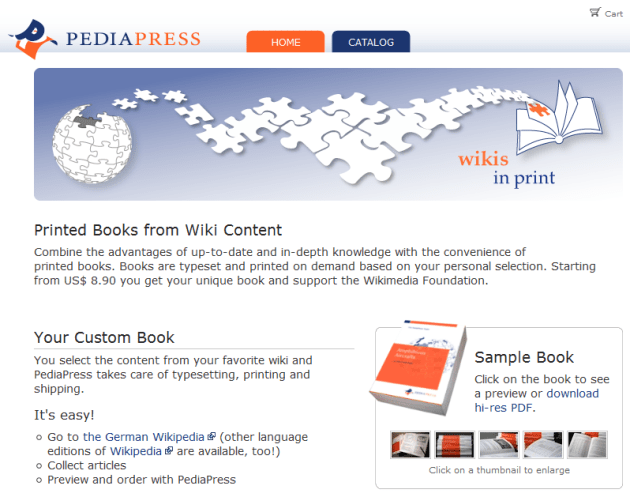 You can, for a while now, thanks to a partnership between Wikimedia Foundation and a German startup called PediaPress. Last week, the wiki-to-print feature was activated for six more languages besides German but as of yesterday the functionality is also being tested on the regular English Wikipedia (restricted to logged-on users only for now). Africa deserves better leaders ..